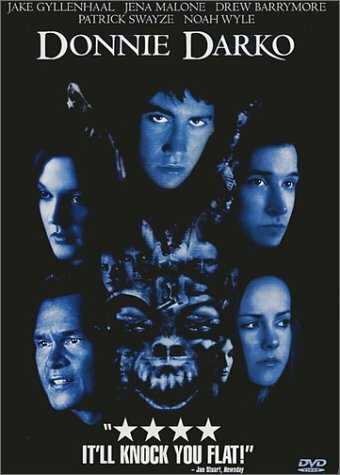 Donnie Darko is about a high school freshman named Donnie Darko who, it becomes evident fairly quickly, has some mental problems. For one he sleepwalks and wakes up far from home every morning. This ends up actually saving his life when a freak accident strikes in the middle of the night—His bedroom is destroyed but he is not there. The film takes place in October of 1988 and periodically dates are shown on the screen along with a countdown to some catastrophic event that Donnie is told will happen by a giant scary looking rabbit during one of his sleepwalk encounters. The rabbit (named Frank) is demonic looking and makes Donnie do seemingly psychotic things that turn out differently than you might initially expect. Donnie calls him “his friend” when talking about him (usually to his therapist) and doesn’t ever seem to fear or hate him. As the movie progresses you start wondering if Frank is real or imagined and if Donnie is progressing towards an inevitable future, or just creating a reality that was initially only imagined. In some ways this reminded me of issues explored in Frank Herbert’s Dune—if someone claims to see the future, are they really seeing it or are they just seeing a possibility and then letting it happen since it’s now the only thing they know. The movie, of course, doesn’t answer this question. Actually, it doesn’t really pose it directly, but I think it was clearly implied. I liked this movie a lot. The acting was good. the visuals were great and it had a mind bending plot that made you think. The pace wasn’t fast, but it was very intense at times and kept me interested throughout. The one downside was that it walked the line between mysterious and confusing and occasionally stumbled too far into confusing. I probably would have given it another half a star except that I don’t quite get it yet. I watched the deleted scenes with director commentary and that actually cleared up a lot. It’s a shame some of the explanation couldn’t have been just a little more straight forward. A minor point: the music was great. I’m not talking about the soundtrack per se, which was fine, but didn’t stand out too much; I’m talking about the 80’s songs they used. Whoever picked the songs certainly had taste. These aren’t the drivel that makes up most 80’s flashback CD compilations—these were actually good songs. There weren’t a lot of them, but I remember Joy Division and Echo And The Bunnymen (maybe a subtle nod to Frank, the giant demonic rabbit). I particularly thought the Joy Division song (Love Will Tear Us Apart) was used very appropriately, it’s bleak message matching the detachment of Donnie by this point, and the upbeat music perfectly the party it was being played at. Go watch this movie, and then go tell me what the heck it was about!